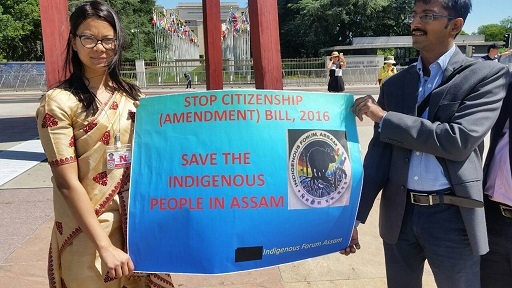 The Indigenous Forum, Assam, a joint platform of over 30 organisations representing various indigenous communities, on Friday staged a protest demonstration in front of UN at Geneva near the Broken Chair against the Citizenship (Amendment) Bill, 2016. The Citizenship (Amendment) Bill, 2016, seeks to allow illegal migrants from certain minority communities in Afghanistan, Bangladesh and Pakistan eligible for Indian citizenship. Simply put, the proposed bill amends the Citizenship Act of 1955. The Forum members raised their protests against the Bill at Geneva in Switzerland on Friday. In Assam the proposed Bill created flutters as various organisations raised the banner of protests against the Bill.